Jamtastic! Yeah, you heard me. 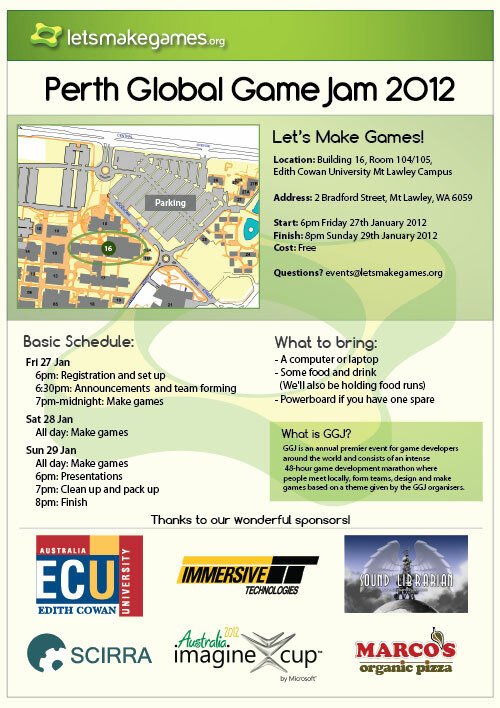 If you have not yet registered for Global Game Jam 2012 in Perth there is still time. We have finalised the internet arrangements so you will have to BYO internet, but we still have a few physical spots left in the room. Go to the GGJ site to register while you still can. 6pm sharp – be there! The theme will be revealed by video during the announcements. Have all of your software tools ready as internet may be somewhat restricted due to the venue’s filtering policies. Finally, don’t forget to read the GGJ site for specific rules. Free after 5:30pm on Friday for attendees, and for the entire weekend. Park in bays marked: staff, students or visitors. Some snacks will be provided, including fruit. We will do food runs at approximate meal times so please bring money if you want to participate. We will announce these with our voices! There are also vending machine snacks and coffee available nearby. For those who have signed up here is the VPN information. You will be provided with a username and password when you arrive.